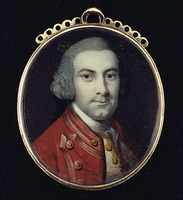 KERR, ROBERT, doctor, Indian Department officer, judge, and office holder; b. c. 1755 in Scotland; m. Elizabeth Johnson, daughter of Sir William Johnson* and Mary Brant [Koñwatsiˀtsiaiéñni*], and they had three sons and two daughters; d. 25 Feb. 1824 in Albany, N.Y.
Little is known of Robert Kerr’s youth, family, or education. He first comes to notice in North America serving as a hospital mate from 1776 to 1781. He was with John Burgoyne*’s expedition of 1777, when he was taken prisoner. Following his release he joined the 2nd battalion of the King’s Royal Regiment of New York, and his zeal in service with this unit earned him the approbation of his superiors. After the war he settled in Cataraqui (Kingston, Ont.) and cared for the newly settled loyalists there, but by 1789 he had moved to the Niagara area, which was the scene of his activities for the remainder of his career. Kerr was a prominent freemason, acting as deputy grand master of the Provincial Grand Lodge from 1797 to 1802 under William Jarvis*. 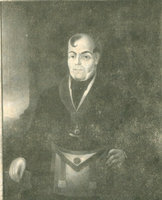 During a rupture in Upper Canadian masonry which probably reflected the rivalry between York (Toronto), where Jarvis had moved, and Niagara (Niagara-on-the-Lake), Kerr was active in forming a schismatic provincial grand lodge at Niagara in 1803 and was its grand master from 1807 till his retirement in 1820. It would seem some tribute to Kerr’s tact and diplomacy that he remained an honoured member of the combined grand lodge after 1822, when the schism was healed. Kerr had become surgeon to the Indian Department in 1788, at a salary of £100 per annum, and he retained that position until at least 1820. He also attended the Royal Artillery at the fort, and marine, engineer, barracks, and commissary departments, and in the absence of the regimental surgeon performed his duties as well. 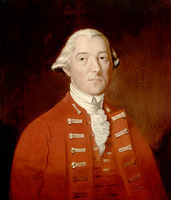 In late 1789 or early 1790 Sir John Johnson, to whom he was related by marriage, proposed him as a member of the Executive Council of Upper Canada to Governor Lord Dorchester [Guy Carleton*], but he did not receive the appointment. Kerr did, however, hold many other public positions. He was judge of the Surrogate Court for the Niagara District from 1792 and was a member of the land board, commissioner of the peace, commissioner for administering the oath to half-pay officers, and trustee for public schools, all in that district. As well, he was a member of the Medical Board of Upper Canada from 1822, although he seems to have attended once only. In addition to his many other duties, the doctor conducted a private practice of medicine. His bill for the care of William Jarvis’s household indicates that, as was usual at the time, he relied largely on purging and bleeding. He also treated the family’s horses. In 1794 he billed William Berczy* £70 for attending the German families at Queenston, and three years later he advertised, along with Dr James Muirhead, the availability of smallpox inoculation (free for the poor). He appears to have remained in active practice almost until the end of his life. 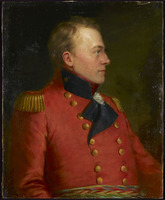 Kerr, although then well into his 50s, played a substantial role in the War of 1812. He was important enough to be a member of the formal entourage for the funeral of Sir Isaac Brock*. He lost a case of instruments in the American capture of Niagara on 27 May 1813, attended brigade-major John Baskerville Glegg at the British headquarters on Burlington Heights (Hamilton) the same year, and treated the wounded at the battle of Chippawa in 1814. His house and barn at Niagara had been burned by the Americans in 1813 and his claims for war losses amounted to £1,227. About the time of his death, in 1824, it was announced that claims were to be paid at the rate of 25 per cent; Kerr or his heirs would receive £306. Like many others, Kerr had devoted time to the pursuit of land. In 1795 he stated that he owned 2,200 acres and believed he should get more. By 1797 he had grants totalling 2,856 acres, a relatively modest amount for the time. 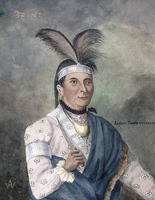 Kerr’s daughter Mary Margaret married Niagara businessman Thomas Clark; his son William Johnson Kerr* married Elizabeth Brant, daughter of Joseph [Thayendanegea*], thus strengthening the ties of the Kerrs with that prominent Mohawk family. Two portraits of Robert Kerr are located in the John Ross Robertson coll. of the MTL. AO, RG 1, A-II-1, 1: 89. PAC, MG 23, HII, 6, vol.2: 377; MG 24, K2, 10: 158, 161–62; RG 1, L3, 268: K1/1–3, 7, 21, 24; K2/17, 23, 29; K4/8, 14, 20–22; 269: K5/29; L4, 6; RG 5, B1, 1; B6, 1, letter from Kerr, 15 May 1820; D1, 24: 183; RG 8, I (C ser. ), 84: 206; 287: 9; 288: 10–11; 704: 305. Thomas Gilcrease Institute of American Hist. and Art (Tulsa, Okla.), John and Guy Johnston docs., p.84 (photocopies at PAC). The battle of Queenston Heights . . . , ed. John Symons (Toronto, 1859), 19. The Talbot papers, ed. J. H. Coyne (2v., Ottawa, 1908–9), 1: 187. Chadwick, Ontarian families, 1: 67. 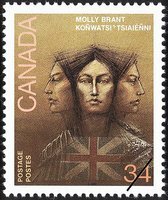 Jean Johnston, “Ancestry and descendants of Molly Brant,” OH, 63 (1971): 86–92. Officers of British forces in Canada (Irving). William Canniff, The medical profession in Upper Canada, 1783–1850 . . . (Toronto, 1894; repr. 1980). Carnochan, Hist. of Niagara. J. R. Robertson, The history of freemasonry in Canada from its introduction in 1749 . . . (2v.,Toronto, 1900). William Colgate, “Dr. Robert Kerr: an early practitioner of Upper Canada,” Canadian Medical Assoc., Journal (Toronto), 64 (1951): 542–46. Charles G. Roland, “KERR, ROBERT,” in Dictionary of Canadian Biography, vol. 6, University of Toronto/Université Laval, 2003–, accessed April 26, 2019, http://www.biographi.ca/en/bio/kerr_robert_6E.html.